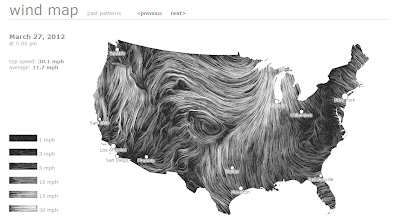 Yes, that's right, a map of wind patterns across the US. Utilizing data from the National Digital Forecast Database, two Google computer scientists developed this great tool that shows the direction, speed and pattern of wind. Click the link below to see the live wind map (if the map takes too long to load, try viewing moving Snapshots of Winds Past).